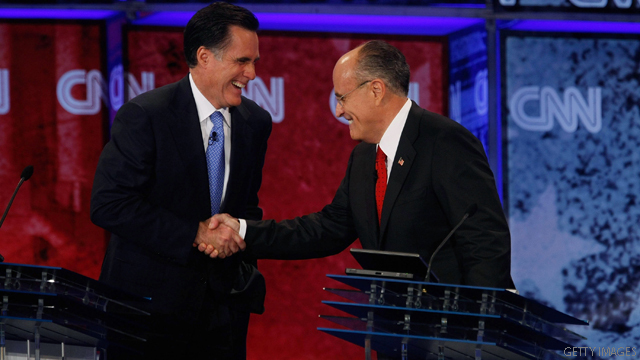 Then-Republican presidential candidates Mitt Romney and Rudy Giuliani shake hands during the CNN-YouTube Presidential Debate on November 28, 2007 in St. Petersburg, Florida. (CNN) – Rudy Giuliani will appear at an event with Mitt Romney on Tuesday to mark the anniversary of the assault on Osama bin Laden, a campaign aide confirmed to CNN. Giuliani, the former New York City mayor, announced his support of the presumptive Republican presidential nominee last week after voicing support for Newt Gingrich and criticizing Romney earlier in the 2012 election cycle. Romney and Giuliani ran against each other in the 2008 GOP primary, during which Giuliani's leadership surrounding the events of 9/11 took center stage. Tuesday's impending event will be the first public meeting of the two Republicans. - CNN's Kevin Bohn and Gabriella Schwarz contributed to this report. Correction. My comment about the Rove "smear and fear" campaign should have been 2004 not 2008. Sorry abut that. ... Following the raid, Republicans and conservatives alike were chastising Pres. Obama for taking the action..
And you are exactly wrong here. Republicans, conservatives and everyone else including myself were quick to congratulate the Administration for this accomplishment. And I will not stand in the way of Obama making this the centerpiece of his 2012 reelection campaign. Front and center for as much as he can milk out of it. Pres. Bush rode capturing Saddam Hussein for all it was worth, and more than it was worth. "Mission Accomplished"
Got to give him credit for his hapless efforts though. When folks say Mitt's out of touch with reality, they know what they're talking about. Seal Team 6? Do they get any credit even though it's 2012, unemployment is still above 8% and national debt is $16 trillion? Perhaps the President should have landed on an aircraft carrier in a flight suit. That way he'd be SURE to get the credit right ? Gotta love the GOP and their posters. Do as I SAY not as I DO. Before Romney gets too Buddy Buddy with Guilliani he might check out his past as Mayor of New York.His wife kicked him out because he was bringing home Girl friends to the mansion while his kids were living there. He has a Questionable lifestlye that associates him with questionable people.Getting kicked out of the Mayors mansion while still Mayor puts him in a class all by himself. He lives a non mormon type of life!!!!!!! Obama wouldn't even know how to get into a flight suit or any other military uniform for that matter, let alone fly a fighter jet.